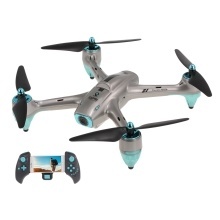 6957G drone features with GPS positioning and altitude hold function, which is perfect for aerial photography. The 5G WIFI 720P camera enables you to have a further real-time images transmission image for fantastic video/picture taking, which is really a great flight combination. Moreover, it is fantastic with functions headless mode, one key return, and one button take off/landing. Just come and get it! The 5G WIFI 720P wide angle camera enables you to have a further real-time images transmission image for fantastic video/picture taking. Altitude hold mode makes it easier to control the drone for beginner and more stable for aerial photography. GPS positioning mode provides a more accurate flight. One-key taking off/landing/stop makes the operation more convenient and it is very suitable for novice operation. Don&apos;t over-charge, or over-discharge batteries. Don&apos;t put it beside the high temperature condition. Don&apos;t throw it into fire. Don&apos;t throw it into water. Carefully read the instruction before any use, if you are a beginner, it&apos;s advisable to be assisted by an experienced adult.